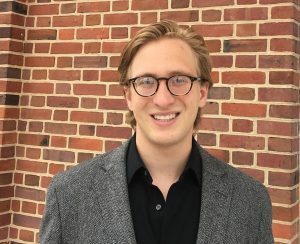 The English Department is proud to announce Will Theodorou, Undergraduate Senior, is the recipient of a Fulbright Award overseen by the Department of State’s Bureau of Educational and Cultural Affairs, to teach English in a Bulgarian secondary school. The Fulbright Program aims to increase mutual understanding between the people of the United States and the people of other countries. Fulbright alumni have become heads of state, judges, ambassadors, cabinet ministers, CEOs, and university presidents, as well as leading journalists, artists, scientists, and teachers. They include 59 Nobel Laureates, 82 Pulitzer Prize winners, 71 MacArthur Fellows, 16 Presidential Medal of Freedom recipients, and thousands of leaders across the private, public and non-profit sectors. As a Fulbright recipient and representative of the United States, Mr. Theodorou will exemplify the qualities of service, leadership, and excellence that have been hallmarks of this Program for over 70 years.